Facebook is sorry today too. Her message couldn’t have been any more, um, unclear. What does the Cambridge Analytica scandal have to do with the graduating class of 2018? Perhaps she was simply reaching out to anyone in the class who, like her, was partially complicit in the defrauding of the American people by selling our data to a company that then digitally gerrymandered the 2016 presidential election. Maybe Sandberg wanted those people to know they weren’t alone. There’s hundreds more, maybe even thousands. 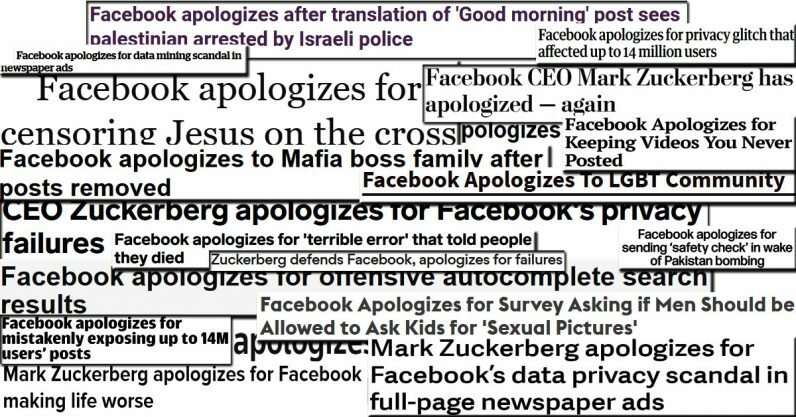 Faceboook apologizes a lot. Unfortunately, it doesn’t appear to follow through as much. And some of these things are beyond the pale — no executive should ever put themselves in the position of having to apologize for conducting psychological experiments on the general public. So here’s an idea for Zuckerberg and the rest of the senior executives at Facebook: hire a Chief Apology Officer to do the job full time. Doing so would free up Sandberg and Zuckerberg to do whatever they would actually be doing for the company if they weren’t always making the rounds on the mea culpa circuit. The only alternative would be to make better decisions, weigh the consequences of company actions, and provide greater transparency — but what are the odds of that happening? And for what it’s worth, I’m sorry too. I’m sorry that Facebook doesn’t have better leadership.